A pair of strangers with questionable pasts arrive in the reclusive southwestern town of Dreary and unknowingly fulfill an old prophecy that the residents of the town believe will precede the coming of the Apocalypse. 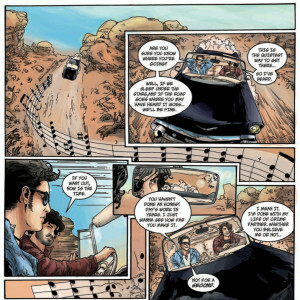 Patterned after iconic Westerns and 1950s rockabilly, this comic is full of classic cars, pompadours, and rock-n-roll mashed up with the folklore of the American southwest. 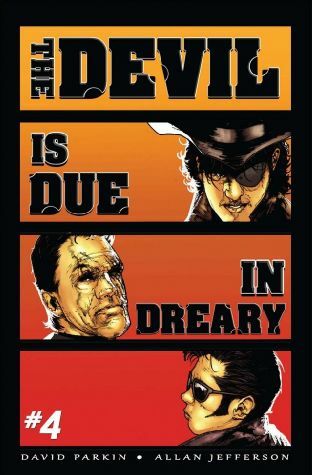 The Devil is Due in Dreary is a set of four 22-page comicbooks that was later re-packaged as graphic novel. The story was Written and created by David Parkin with cover artwork from Alex Sanchez, interior pencils by Allan Jefferson, inking by Jonas Trindade, and coloring by Diego Tapie and Rainer Petter. Daryl Freimark served as both Producer and Executive Editor of the project. You can find out more about The Devil is Due in Dreary by going to their Facebook page, or their web page. We were recently able to sit down and talk with David about this project. Robert J Sodaro: Can you tell us a little bit about the background of The Devil is Due in Dreary? David Parkin: I keep a long list of ideas and I love to combine them to find something unique. This one came from two sentences on that list, “A lost hiker rescued by a cult” and “A western without horses.” From there, it’s been 10 years of working, re-working, and working some more to get it out there. RJS: On some level this story seems to be a cross between a classic Western like High Noon, and a ‘50s-style Rebel Without a Cause film. I’m assuming that was intentional. David: Yes, I love blending genre and turning tropes on their head. I believe the best ideas come by way of questions and challenges. “What is a western, exactly?” “At what point does a western stop being a western? Would it work in modern day?” etc. That’s always a fun way to start because you’re guaranteed to end up somewhere creative thinking that way. 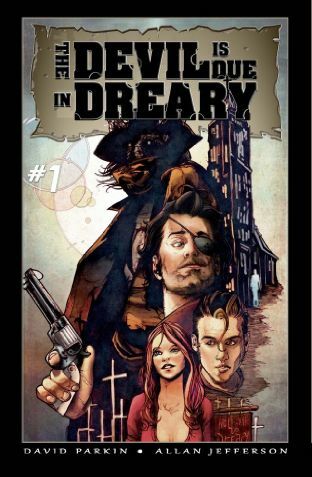 RJS: Having said that, and given what rich fodder that comics have become for films over the past few years, this comic looks like it would be an ideal project to make the jump to film, is there anything like that in the works? David: I’m glad you asked. We are working on the film as we speak. This actually started as a screenplay for a film and the plan is/was to get to the movie by way of the comic. I’ve always been an avid comicbook reader so it has been a dream come true to take this step. Daryl Freimark, the Executive Editor is actually a film producer by day so we’re in good hands. 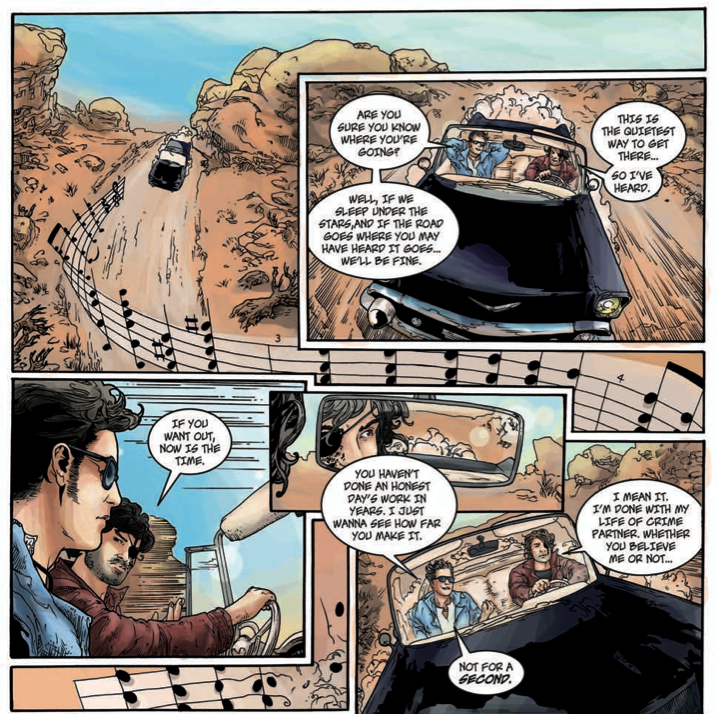 RJS: You launched the comic via Kickstarter, what was that experience like? David: Fantastic. Kickstarter couldn’t have been more helpful and supportive. We actually had two campaigns over the process of making the four books (now combined into one trade paperback) and it was a true honor to have backers from all over the world show their support. We were able to meet some lifelong fans/friends and that was, by far, the best part of the process. RJS: Tell us a little bit of your own background and that of your co-contributors. David: I’ve been passionate about movies and comics and storytelling since I was very little. I started making documentaries right out of High School, moved to Los Angeles with my wife 10 years ago, and we’ve been working in the entertainment industry in some capacity ever since. I am also a passionate storyteller who started my career over at New Line Cinema, where I co-produced Hairspray (the musical with John Travolta). Since then I’ve produced numerous independent films all with the same goal — to tell a great story. Allan Jefferson, our penciller, lives in Brazil and we communicate by email using google translate. Allan is an amazing artist with a long list of credentials. We were fortunate he was so excited about our story and chose to collaborate with us. Alex Sanchez did our cover art. Jonas Trindade was our inker. 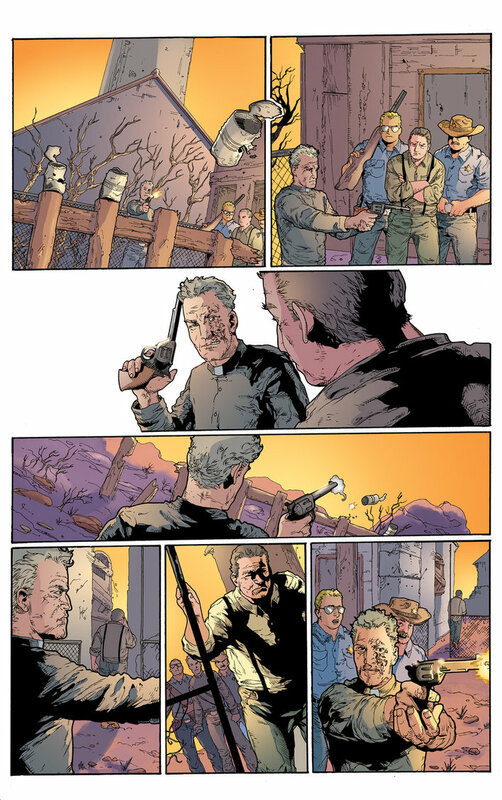 Rainer Petter and Diego Tapie did the color and Rich Emms and Frank Barbiere were our letterers. Every one of them are talented and thoughtful and we were honored to have them be a part of our team! RJS: The story has strong religious overtones to it, did you draw on personal experiences to layer that on the story, or are you looking at how the religious Right is acting out in modern-day society? David: It’s interesting, non-religious people usually see the book as a critical take on organized religion and religious people see it as a cautionary tale for those who follow too blindly. Personally, the message I want to convey is to beware of anyone who offers to do your thinking for you. That’s good advice no matter where your affiliations lie. RJS: In the book’s editorial you talk about how the story was inspired by a Twilight Zone episode, could you go into that for us? David: The title of the book, The Devil is Due in Dreary, pays homage to The Twilight Zone episode, The Monsters are Due on Maple Street. Both are stories about a community of people cut off in their own way from news and technology. Both communities let their imaginations get the best of them and terror ensues. My first exposure to The Twilight Zone was through an English class in Jr. High when we read the script from that episode as an assignment. It scared the hell out of me and the topic of fear and paranoia have been a big part of my stories ever since. RJS: Do you see this as a stand-alone tale, or can you foresee future adventures of your two protagonists, Tino and Jack? I think Tino and Jack have a long road ahead of them and I would love to explore where it goes. RJS: The folks who live in this isolated town seem to be at the mercy of this preacher, why do you think that they don’t leave? David: It’s the same question with any cult member. As I said before, fear can be a powerful tool to get people to conform. Most people don’t leave in situations like that because their leader has done his, or her, best to keep them afraid of the outside world and the thought of making that transition is often too overwhelming. RJS: Do you believe that the people in Dreary are reflective of people in small towns in middle America? David: You can find gossip and uneasiness with the unknown anywhere from big cities to small towns. RJS: What do you have coming up next? David: I’m working on another comic right now. My favorite genre: Kids on bikes solving mysteries! I’m putting together the pitch and talking to publishers now. I’m also writing a few feature films and working on a podcast that I’m very excited about. RJS: Anything else you want to talk about pertaining to The Devil is Due In Dreary, or another project? David: I’d just like to thank you for taking an interest as well as all the readers out there that pick it up. It is truly a labor of love and it makes my day every time someone tells me they enjoyed reading it. 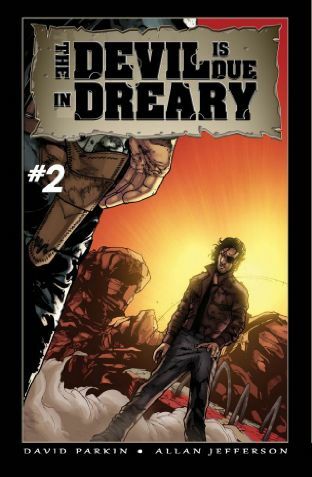 And if anyone wants to pick-up a copy, you can do so at our website, thedevilisdueindreary.com. The Devil is Due in Dreary as well as all artwork displayed, and all material mentioned in this article is © & TM 2015 their respective copyright holders. All rights reserved. Robert J. Sodaro is a noted comicbook historian and journalist who began reading comics during the early ‘60s while sitting on the newsstand in his Uncle’s “Mom & Pop” grocery store. He has written about them for virtually every print comicbook publication published during the ‘80s & ‘90s. These days, much of his writing can be found on HubPages. Loved the book! Great story and great read! 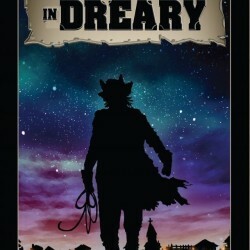 If you like Westerns or Twilight Zone types of tales or if you just dig a good story and interesting characters, well then this book is for you!